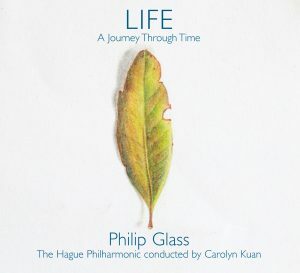 Orange Mountain is proud to announce the release of the world premiere recording of LIFE: A Journey Through Time with The Hague Philharmonic (Residentie Orkest) under the direction of Carolyn Kuan. Commissioned by the Cabrillo Festival of Contemporary Music and conceived of by nature photographer Frans Lanting, LIFE: A Journey Through Time is a multimedia experience with images by Lanting and music by Philip Glass that showcases the wonders of the natural world. The hour-long score is cast in seven movements and was drawn from previously existing music in the Glass catalogue from a variety of sources, orchestrated for the first time by Michael Riesman. Since its premiere in 2006, LIFE has been performed dozens of times including in an abbreviated version, ORIGINS, at the inauguration of the Large Hadron Collider in Switzerland for an audience of international dignitaries. Next Next post: Symphony No.5 in New York next month!